ONISTAH-SOKAKSIN (Calf Shirt; sometimes called Minixi or Wild Person), leader of the Nitayxkax (Lone Fighters) band of Blood Indians (a division of the Blackfeet), d. in the winter of 1873–74 at Fort Kipp (Alberta). Calf Shirt was believed to have gained supernatural and ferocious powers from a grizzly bear. A chief who was held in awe by his followers, he, unlike other chiefs, was known for his constant hostility to white traders. 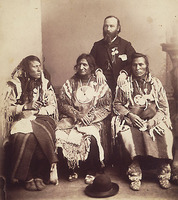 Calf Shirt’s name appears first in 1855 when he signed a treaty with the American government on behalf of his band, who commonly wintered along the Belly River. This treaty attempted to establish peaceful relations between the Blackfeet and the United States government, and between the Black feet and their enemies, including the Flatheads, Pend d’Oreilles, Kutenais, and Amikwas (Nez Percés). It set aside an exclusive hunting area for the Blackfeet, allowed for the peaceful entry of missionaries and the building of military posts, and provided for an annual annuity of $20,000 for ten years. In 1865, when two fellow chiefs were murdered by Americans, Calf Shirt led a war party which wiped out a number of pioneers who were establishing a town called Ophir, in Montana Territory. After the raid, plans for building the town were abandoned. Four years later, he tried to kill a Catholic missionary, Father Jean B. Imoda. By 1870, Calf Shirt had become a leading war chief of the tribe, with a personal following of 72 warriors and with 288 persons in his Lone Fighters band. Initially he had traded with both the British and the Americans, but after his 1865 raid he did business primarily with the Hudson’s Bay Company. In 1869, however, Americans built illicit trading posts in the heart of Blackfoot territory (southern Alberta), where they sold whiskey and repeating rifles. During the winter of 1873–74, Calf Shirt visited one of these establishments, Fort Kipp, and was killed by the proprietor, Joseph Kipp, during a dispute about liquor. Calf Shirt’s wives, believing he had the power to come back to life as a grizzly bear, began the necessary rituals but were restrained from completing them by other Indians because of the fear they had had for him in human form. After Calf Shirt’s death his band was amalgamated with the Awaposo-otas (Many Fat Horses) band under the leadership of Aka-kitsipimi-otas (Many Spotted Horses), a wealthy and respected war chief; the new band kept the name of the largest group, Nitayxkax. H. A. Dempsey, “Blood Indian bands; their identification and history” (unpublished ms in the possession of the author, 1955). Montana Historical Society Collections (Helena, Mont. ), Biographical files, John J. Healy. National Archives (Washington), Census of the Blackfeet Indians, Alfred Sully to E. S. Parker, 16 July 1870. Forest and Stream (New York), 18 July 1903. Fort Benton Record (Fort Benton, Mont. ), 31 Jan. 1879. Montana Hist. Soc., Contributions, X (1940), 275. J. C. Ewers, The story of the Blackfeet ([Lawrence, Kansas, 1944]), 39. H. A. Dempsey, “The amazing death of Calf Shirt,” Montana; the Magazine of Western History, III, no.1 (1953), 65–72. 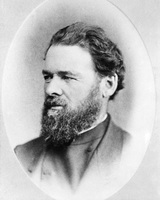 Hugh A. Dempsey, “ONISTAH-SOKAKSIN,” in Dictionary of Canadian Biography, vol. 10, University of Toronto/Université Laval, 2003–, accessed April 26, 2019, http://www.biographi.ca/en/bio/onistah_sokaksin_10E.html.